Eastern Mennonite University alumna Meghan Painter MBA ‘13 has been named one of the community’s top 10 rising business leaders under age 40 for 2018 by the Shenandoah Valley Business Journal. 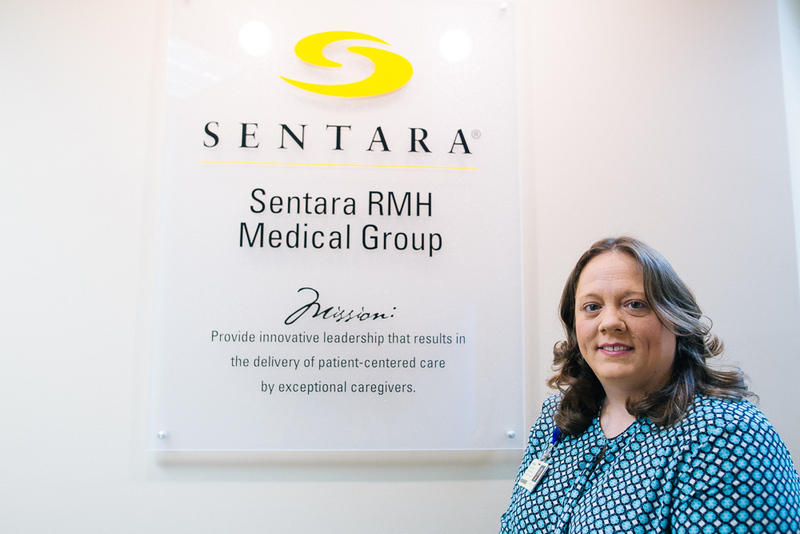 She is the business operations director at Sentara RMH Medical Group. On her way to and from school when she was a child, the Shenandoah Valley native would often accompany her father to the hospital where he was a physical therapist. Now, Painter supports over 150 medical care providers with behind-the-scenes administrative oversight for the daily operations, insurance credentialing, data reporting and finance, while supervising six analyst specialists. 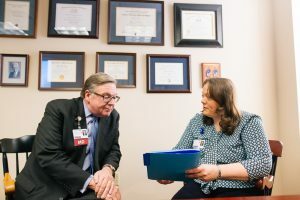 Meghan Painter, director of business operations at Sentara RMH Medical Group, talks with fellow EMU alumnus Dr. Edward A. Sandy. After earning her bachelor’s degree in health service administration and minor in business at James Madison University in 2002, Painter worked for five years in a private multispecialty practice, in part obtaining certification in medical coding, working as a member of a team that implemented electronic records, and helping to shape the revenue cycle. The on-the-job experience and knowledge that she gained there were “valuable to my development as a healthcare leader,” she said. In 2007 she accepted a management position at Rockingham Memorial Hospital (now Sentara RMH), ultimately also filling billing, financial/reimbursement analyst and revenue cycle project manager roles. She was promoted to her current position in 2017. It wasn’t until 2011, with nearly a decade of experience under her belt, that Painter enrolled in EMU’s MBA in health services administration program. Several factors drew her to EMU’s program: small class sizes, personal relationships with professors, the hybrid blend of online and on-campus courses, and a program structure that allowed her to continue her full-time employment – and fulfill her home responsibilities – while getting her degree. And there was the program’s philosophy of leadership for the common good. “A focus on people, planet, and profits is mutually beneficial,” she said. Living and serving in the area where she has lived her whole life is a priority for Painter; studying at EMU also allowed her to stay in the Shenandoah Valley.